A whacky concept that fails to translate into a fun video game. It's nice to include willful nonsense like Portable Shrine Wars now and then. Not because it's necessarily any good (it isn't), but because it's fun to wonder out loud how on Earth things like this ever get off the drawing board. As part of GameBridge's never-ending, barmily experimental GO Series, Tom Create's cheerful effort focuses on the Japanese summer festival tradition where dozens of people carry a huge portable shrine on their shoulders called a Mikoshi. 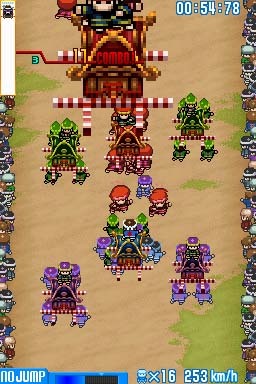 To take the bizarre practice one step further into the surreal, Portable Shrine Wars pits you against teams of Mikoshi carriers in a race. For the initial part of the race, you guide your Mikoshi up the screen trying to build up speed, and doing so involves running into any stray carriers that may have been barged off their respective Mikoshi. The more carriers you have, the faster you'll go. And as if barging a gaggle of opponents around the place wasn't chaotic enough, you can leap high into the air and try to flatten them instead, or elect to launch your carriers like missiles to smash up anyone in front of you. As well as having to leap across bottomless pits, you also have to take care of giant festival bosses by repeatedly stomping on them. Obviously. But despite its hugely endearing premise, the dizzying, chaotic novelty soon turns into a muddled scrimmage where success tends to be measured as much in luck as in skill. If you've got cash to burn, pick it up and laugh for five minutes. Otherwise, just watch the trailer. It does much the same job. What's Not: Boring and frustrating gameplay.